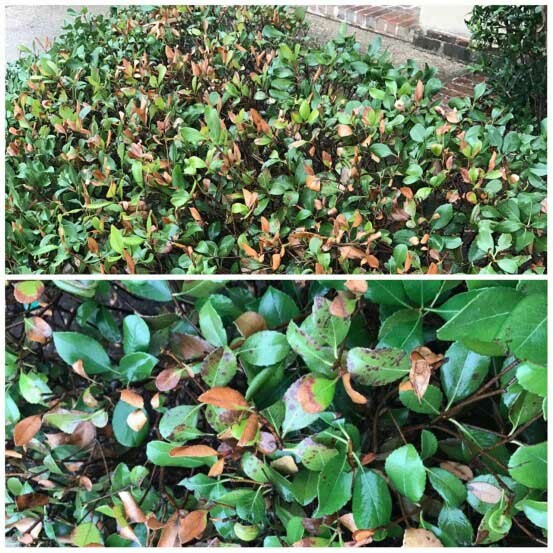 Freeze damage could be the reason your yard is experiencing a longer transition out of dormancy. I don’t know if it’s just me, but the weather the last couple of weekends has made me ditch the indoor chores for some much needed outside work. For some of you, this is the first time you’ve actually gotten a close up look at your plants and landscape since last fall. Are you not liking what you see so far? You may be noticing that your turf or plants are not looking as fresh or as green as the weather is telling you they should. No need to worry just yet! Remember that the transition from dormancy to spring green up is still in effect and could continue up until the first of May. The weather predictions for the next couple of weeks are calling for a few cold fronts so that will extend the period of time it will take for everything to completely come out of dormancy. 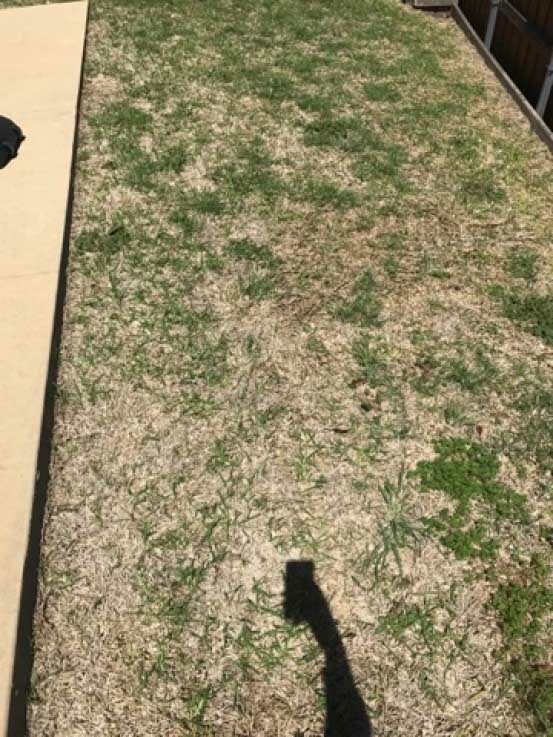 These pictures show the difference in yards transitioning out of dormancy with freeze damage (left) and without (right). If you feel like you are seeing something outside of the norm, seek professional help! We have been noticing an interesting amount of freeze damage in a handful of landscapes this spring. After we put all the pieces together, we realized that the damaged areas had previously been infected and weakened by a pathogen. Most commonly, St. Augustine infected by Take All Root Rot (TARR) and Indian Hawthorns infected by Entomosporium Leaf Spot (ELS). Freeze damage in Indian Hawthorns previously infected with ELS. Some of you may be thinking: the winter was so mild, why would a couple of 18 degree days have that much impact on the plants? Since we hadn’t had a hard freeze in almost 2 years, some of the weaker plants were not ready for the shock of the cold so they did not survive. Are there any possible preventions for next winter? 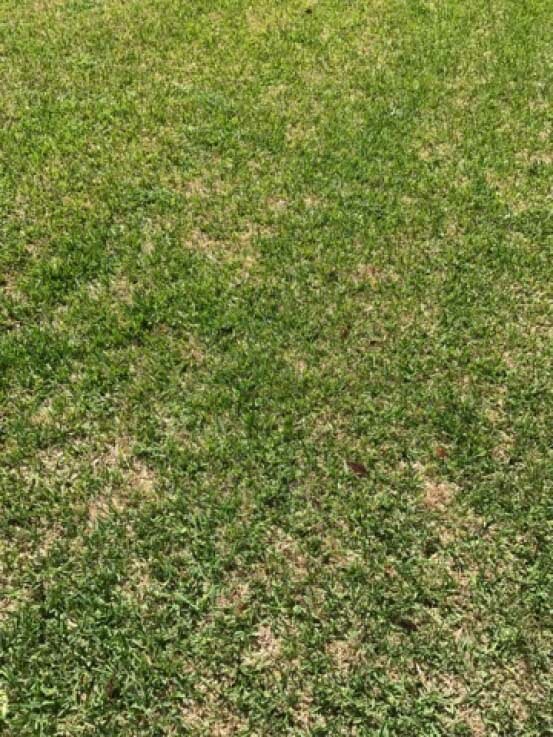 St Augustine is very susceptible to fungal issues so, it could be more practical for you to resod with Zoysia or Bermuda as they are much less vulnerable. However, it is imperative to consider your growing environment, particularly sun exposure, as each grass requires different amounts of direct sunlight.